Heat oven to 350°F (325°F for dark or nonstick pan). Place paper baking cup in each of 24 regular-size muffin cups. Make cake batter as directed on box, using cake mix, 3/4 cup fruit juice, 1/2 cup champagne, the oil and egg whites. Divide batter evenly among muffin cups (about two-thirds full). In large bowl, beat powdered sugar, butter and salt with electric mixer on low speed until blended. Beat in 3 tablespoons champagne and juice. 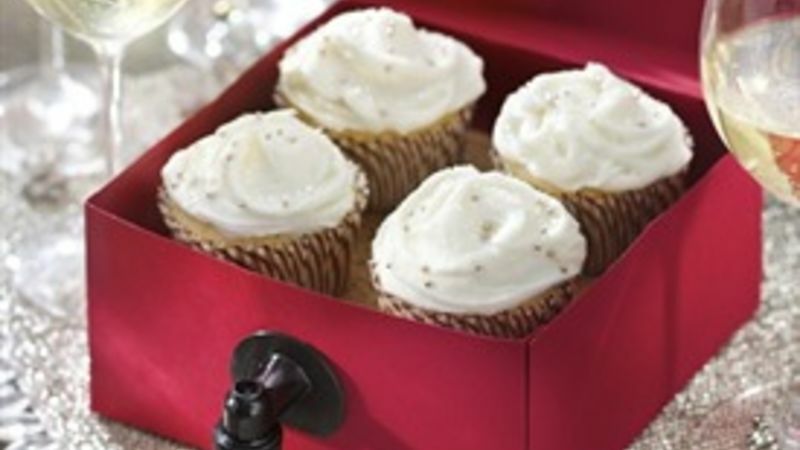 If frosting is too thick, beat in more champagne a few drops at a time. Frost cupcakes. Garnish with white sugar and silver pearls.